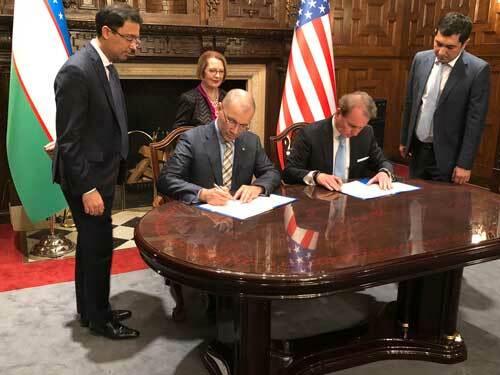 ST. LOUIS: Webster University is pleased to announce that on Feb. 4, 2019, Webster leadership and the Ministry of Higher and Secondary Specialized Education signed documents to support both the programmatic and physical expansion of Webster University in Tashkent, Uzbekistan. “We are thrilled to deepen and expand our opportunities to work with the Ministry to meet the growing educational needs of students in Uzbekistan and the larger central Asian region. Following recent experiences at our Accra, Ghana campus, we see how students long for American programs to help them be successful in their chosen fields and raise the level of achievement in their own country,” said Webster University President Elizabeth Stroble. The Ministry has agreed to provide Webster with state-of-the-art facilities to deliver undergraduate and graduate programs that align with the Republic of Uzbekistan’s plan for development of its economy and human capital. Webster University and Ministry officials will work together to identify, develop and deliver programs to meet current and future student needs. “Since 2012, we have explored with the Ministry various approaches to successfully meet the needs of the citizens of Uzbekistan and other students in the region. We’ve been conducting needs assessments and developing programs that align with new and emerging educational requirements,” said Julian Schuster, Provost, Senior Vice President and Chief Operating Officer at Webster University. The first Webster program offering a Master of Arts in Teaching English as a Second Language (TESL) was launched for the Fall 2018 semester in collaboration with the University of World Languages in Tashkent with 120 students. Nearly twice that number of students applied. Additional launches are planned for increased cohorts in the TESL program as well as a Webster MBA program. With its home campus in St. Louis, Missouri, USA, Webster University (www.webster.edu) comprises an action-oriented global network of faculty, staff, students and alumni who forge powerful bonds with each other and with their communities around the globe. Founded in 1915, Webster is a private non-profit university with students studying at campus locations in North America, Europe, Asia and Africa and in a robust learning environment online. The university is committed to ensuring high-quality learning experiences that transform students for global citizenship and individual excellence.